In Amerigo, players are discovering new lands that are rich with resources. Game play requires players to be both strategic and tactical. In the early stages of the game players must aggressively sail the lands and claim territory for later exploration. Later in the game players will be reinforcing their territories with buildings and claiming the resources as they explore. Game set-up consists of a modular board that shows the islands to be explored that is sized differently for the number of players. The islands all depict resources and a matching token is placed on all the resource spaces. A storage board which holds the various items for the game as well as tracks points and player order. At the beginning of the game 5 pirate tokens are randomly selected, and once per round, one is flipped—they have the values 0, 0, 1, 2, 3, 4. Each player has their own player board on which they track their cannons, gold and progress as well as storing the resources collected during exploration. Each player also has 12 trading posts, two ships and five discs for the various tracks. As with most Feld games, there are lots of bits to set up making it a bit fiddly. The main component of the game is, of course, the dice (or cube) tower. Before your first play, make sure that the tower is correctly assembled and carefully insert it into the base. If it is not properly set, cubes will get trapped and never come out of the tower. To begin the game all 49 cubes (7 of each color) are dropped into the tower and those that fall out are stored in their appropriate space on the storage board. The game begins with a player taking all blue cubes on the storage board and dropping them into the tower. All cubes that come out, regardless of color, are placed into the center of the cube area on the storage board. The cubes determine the number of action points (AP) as well as which actions are available. The number of actions is equal to the highest number of cubes that came out of the tower of one color. The particular actions available are based on the colors that came out. For example—five blue cubes, one red and one brown cube have come out. This means that each player can have 5 AP (5 from the blue cubes) and the 5 AP can be blue or red or brown—they must all be the same color. Each turn begins with the cubes for that turn being dropped into the tower. So, what are the possible actions? -Blue is moving ships: each player may start each ship on any outer piece and move it the number of AP for that turn. If the ship lands on an anchor space, movement stops and a trading post is placed on the marked spot on the island. The second ship is now moved the same number of AP. -Black is for loading cannons: You simply move your marker on your cannon track up the number of AP indicated. -Red is for planning: With this action the player is “buying” building tiles for future settlement on the islands. 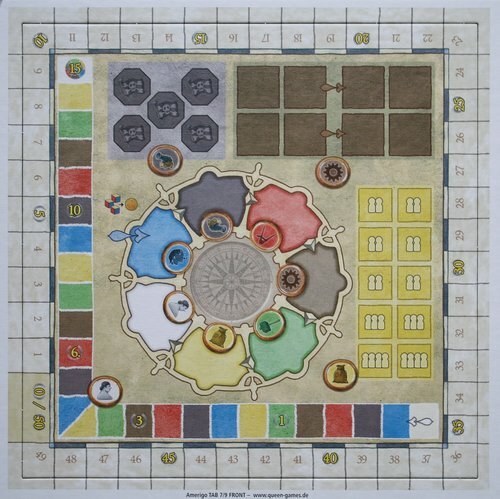 A player may buy ONE neutral tile and as many of his own tiles as he can afford. The cost is represented on the tiles as cubes; you spend your AP up to the number of cubes on the tiles. -Brown is for progress: You move your disc on the progress track the number AP. Should you cross over or land on a victory point (VP) space you may claim one progress token from the storage board for each VP space you passed. -Green is for building: You may now place the building tiles you have purchased onto islands where you have placed a trading post. Your tiles must always be orthogonally contiguous to (1) your trading post (2) your own landscape tile or (3) a neutral tile to which you are adjacent. If you build over a resource token, you claim it and place it on your player board. The green phase is where you will most likely score most of your points. Each tile that you place scores as you place it and you will score bonus points if you complete and island and/or if you have any trading posts on a just-completed island. There will be “large” islands (consisting of 20 or more spaces) that will allow you to score the larger VPs on your tiles; all other islands score the smaller VPs. -Yellow is for buying production tokens: You spend your AP buying production tokens from the storage board that will serve as multipliers in end-game scoring for the resource tokens claimed during the green phase—the number of production tokens multiplied by the number of resource tokens collected. -White is a special action: Your placement on this track determines your player order. It also allows you to take the action associated with the color your disc is on whenever a white cube comes out of the tower. So those are the 7 possible actions. The game is played over 5 rounds; therefore there are 35 “turns” for each player. At the end of the round, players must defeat the pirates by reducing the cannon track by the number of pirated attacking. Failure to do so will result in a loss of VP. There is some clean-up and replenishment on the storage board and them you wash, rinse and repeat these steps for 5 rounds. I should also mention the gold track. During the course of them game you may earn gold in a few ways. Gold may be used as “wild” AP and used during any of the color phases to give you an extra AP or two as needed. Each gold left at the end of them game counts as one VP. End of the game scoring is (1) convert all gold to VPs (2) Goods scoring (3) any progress tokens that may give end-game VPs and (4) VPs based on where you are on the progress and special action track. This is obviously just an overview of the rules and by no means an exhaustive recap, so please consult the full rulebook for a full explanation. So, what do I think of Amerigo? I like it. It seems like it has received negative comments because the cubes that come out of the tower don’t allow for enough variety of actions and players are all doing the same thing every turn. I have played with two different copies and have not had this experience. The game often starts with players doing the same actions the first turn or two but after that it seems that strategies diverge. One factor in this is which progress tiles you may acquire. I like to get the one that allows you to buy two neutral tiles and the one that makes red and green cubes equal. These two allow a player to mix up when they buy and build landscape tiles which gives them an opportunity on the islands to block opponents. I have also had good luck with the progress tile that makes the pirates more expensive for everyone else; they have a harder time ignoring the cannon phase. I mentioned in the beginning that this game requires both tactical and strategic thinking. You are forced to make tactical decisions based on which cubes come out of the tower—they may not be what you want. You should also have a long-term strategy which might require some flexibility. The early game is typically spent aggressively moving ships and claiming islands. The mid-game is about placing building tiles and trying to claim territory that is exclusively yours and the end game is about completing your islands. It is true that if you aren’t careful in the early part of the game, the end of the game can feel a bit redundant and wasteful if you don’t have any territory staked out. The game has a lot going on, but it all flows together logically; I have been successful at teaching this game to “entry-level” gamers and they have been able to have a good time and feel like they have achieved their strategic goals. It really seems to take one round for players to understand the mechanics and then they are able to make decisions and think ahead to their next move. Another plus is that the game has great “curb appeal.” Whenever I set it up people are automatically intrigued enough to come ask about it. The cube tower is definitely a plus, but the rest of the game components look great as well. When I was first approached by Queen to review Amerigo, I thought – hmm… Another Feld point-salad game, but this time with a ship/exploration theme! I’m glad to say that while there are many familiar aspects of Amerigo, there are some elements of the game that help it stand on its own – It’s not just another Feld point-salad game. Karen has gone over the basic mechanics, and you should be able to grasp the basic gameplay from that. The action selection mechanic is reminiscent of the mancala from Trajan, but there are a few interesting tweaks. The big change is the dice tower. 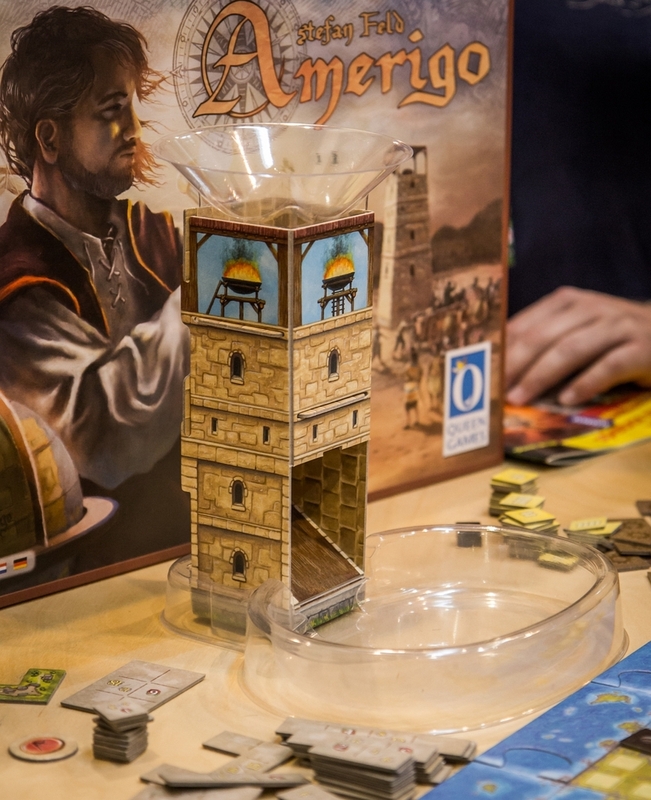 It’s unclear to me whether Feld wanted to make a game using a dice tower or if Queen wanted to re-use its dice tower template – but whatever the reason, the tower serves as an excellent randomizing factor in the game. Generally, you will always be guaranteed to take the action of the color that is being dumped that round. The big question is — whether or not a different colored cube will come out or whether or not a cube stays in the tower to come out at a better time for you. Oftentimes the timing is not overly critical, but I do think there can be a lot of benefit of zagging when everyone else is zigging – as you will not be fighting for the same actions at the same time. The risk/reward of this is that you may need to hope that the cubes come out at the right time in the future in order to do all the other actions you want to do. Many of the other traditional Feldian traits are here. First, there are multiple ways to score points – for exploring, for trading posts on islands, for completing islands during the game. There are also a few end game bits (gold, progress tokens and goods). Second, like all good Feldian games, there is a malus score – this time… it’s pirates! If you don’t have enough cannon to fight off the pirates, then you lose points. The penalty here isn’t as rough as in the past (say Notre Dame or In the Year of the Dragon), but negative points is negative points. Third, the progress tokens give individual rule breaking abilities to the players that collect them. Some of these are definitely better than others, and some combo with others a bit more – so hopefully you’re lucky to be earlier in turn order when the good ones come up! I like the modular setup as it ensures that each game starts a bit differently and prevents gamers from developing a set plan to start the game. Once people are familiar with the game system, it moves along pretty quickly. There will always be a turn or two when someone really needs to think about what action they want to take (or what chances they have of doubling up on a particular action if the cube tower works in their favor) – but for the most part, the turns move along. An experienced 4p group could probably get this done in about an hour or just over. While this isn’t my favorite Feld game – that title is still held by Burgen von Burgundy Burgen Burgen – it’s probably the next most likely to get played by me. Is that just because it’s new? While I’m sure that the newness has something to do with it, I really do like the way the cube tower affects your choices in the game. 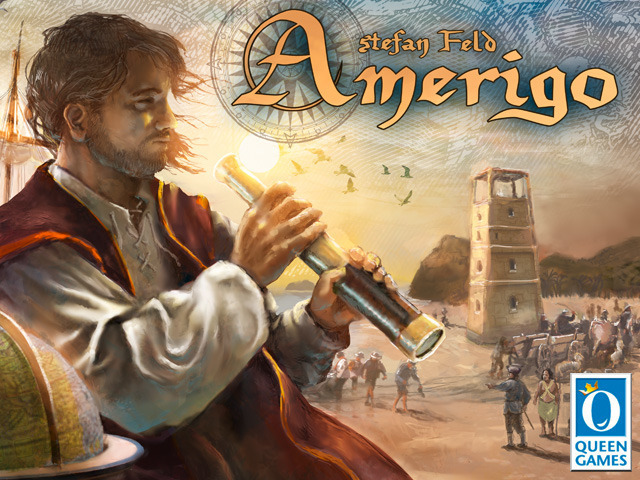 Larry (3 games played): I’m a big fan of Feld’s and Amerigo has lived up to my expectations. Many of his games feature an interesting action selection system and he gives us yet another one here with the cube tower. This works well (as long as the cube tower is properly constructed) and deciding which actions to take and how to carry them out is an enjoyable process. I’m not completely sure how balanced things are, but I have seen different approaches win (although I suspect a good deal of sailing is essential), so I’m not too concerned about that. Even though there’s quite a bit to think about, this has a slightly lighter touch than his heaviest games, which feels appropriate. This may not be top-flight Feld, but it’s still a game I’m very happy to play. Dan Blum (2 plays): I’m not a big Feld fan, but I thought this was a pretty decent effort. Right after my first or second play I’d have said I liked it, and I’d still be willing to play it, but I realized that a)I haven’t played it in months and b)I haven’t missed it at all. Jonathan Franklin (3 plays): I’m not much of a Feld fan either, but of the four efforts from 2013, I liked Amerigo the most. The tower seemed fine and games were really variable, with one having no exploration left in the final round where another game had tons of exploration left at the end of the game. Was that the players? the tower? other? I’m not sure. Patrick Brennan: Very solid. Modular boards are always good for variety. I really like how the tower determines what actions and how powerful they are each turn. Some turns are straightforward and quick, others you have hard decisions over a few actions. They’re the two standout features. After that it’s your basic move-your-ship around the board to different islands, buy tiles, cover island with tiles to score lots of points and get goods tiles, later get goods multiplier tiles, plus compete along two different tracks for turn order (plus VPs) and extra action tiles (plus VPs). So it’s all standard along those lines. Those extra action tiles will end up driving a lot of sway decisions, getting the most out of them to differentiate you from the other players. Plus the decisions on when to move to new (and which) islands and when not. Anyway, it all hangs together nicely. It probably should end after 4 rounds instead of 5 to keep you hanging nicely for more, but I guess once you know what you’re doing, the last round should go by fast enough. While there’s probably not much more to explore in term of what the game will provide, I’m happy to play again for the variety that the action cube tower provides. Jonathan Degann: I am a great Feld Fan, and I find this game to be second-tier. Perhaps the greatest problem is the way the game grinds down into nothingness towards the end. During the game you race to fill islands. You need all the game turns in order to have a decent shot at completing larger islands, but during the last two turns, choices become so whittled down, as islands tend to clog up, that the game feels like it has lost its welcome. Some decisions which ought to be agonizing really aren’t. Take the case of the pirate penalty. It is a very linear penalty – one point per cannon needed. You can reasonably estimate the cost/benefit. Generally, in the beginning, just pay the points; in the end, when there isn’t much else to do, collect the cannons. I think this game could have used more development. The spark of Feld brilliance isn’t there. That said, the first turns do offer tactics and strategy, and a weak Feld is better than most of what is out there. Super-important error in the description of how many actions you get, one that will radically affect how the game plays (so if you’re playing with the wrong rule, I highly encourage you to try it again by the rules): the total number of actions in a turn is equal to the number of cubes of the highest color, NOT the total number of cubes. • The colors of the cubes emerging from the tower determine which actions are available this phase. • The largest number of cubes of a single color determines the number of action points (AP) that can be spent on a single available action during this game phase. So in your example, “5 blue cubes, one red and one brown cube”, you have 5 action points in blue, red, or brown, not 7. This is my favorite Feld since Burgundy. I really like it, probably love it. I liked this quite a bit the one time I played it, except for the latter part of the game, especially the last round: the cube tower didn’t work as well as I’d hoped! In the second part of the game most of the time only one color cube was coming from the tower, with few or no cubes left in the game and few color options from which players could choose what action to take. The last round was also a bit anticlimatic: with most islands pretty full already, there was little left to do with several actions. Plus, the game was sloooooow, although that may have been more the players than the game (we were all new)!